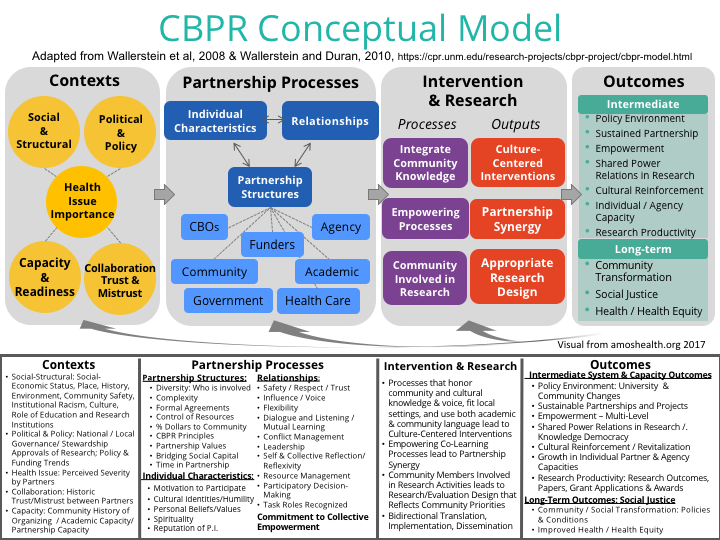 Community based participatory research (CBPR) and Community Engaged Research (CEnR) is growing rapidly in the U.S. and internationally as a core approach to reduce health inequities. Despite this rapid growth, there is little to no national consensus on measures or metrics of partnering practices, nor on the promising or best practices that contribute to research, community capacity and system changes, or health outcomes. Without internal evaluation and self-reflection, adoption of best practices for partnership quality improvement and health impact is limited. In 2015, the University of New Mexico Center for Participatory Research received funding for Engage for Equity: Advancing Community Engaged Partnerships (from the National Institute of Nursing Research, 2015-2020; 1R01NR015241-01A1) to extend the science of CBPR and CEnR.Engage for Equity supports the refinement of measures and metrics for partnering practices and outcomes, and the creation and implementation of workshops with tools and resources to strengthen partnership practices to reach research, capacity and health equity goals. It builds from the recently-completed NIH study, Research for Improved Health (RIH), where we tested our CBPR Conceptual Model; developed and psychometrically validated process and outcome measures with surveys of 200 partnerships; and began to indentify promising practices associated with outcomes from our data. Available on the Research for Improved Health webpage are: RIH survey instruments; focus group and interview guides; project codes of ethics; publication lists; translations of the model in Spanish and Portuguese; and adaptations and use of the model by other research groups. 3) To conduct a randomized control trial comparing an interactive training intervention and partnership evaluation and self-reflection toolkit for 40 partnerships (4 trainings with 10 partnerships each) versus access to Toolkit materials and resources on the web. For more information, contact: Principal Investigator, Nina Wallerstein, nwallerstein@salud.unm.edu; or Shannon Sanchez-Youngman, at the Center for Participatory Research, cpr@salud.unm.edu, or call (844) 377-1275 toll free.